Alec Baldwin Drops Pants, Talks Photog Fracas on "Letterman"
Alec Baldwin explains what went through his head during an alleged confrontation with a New York Daily News photographer. 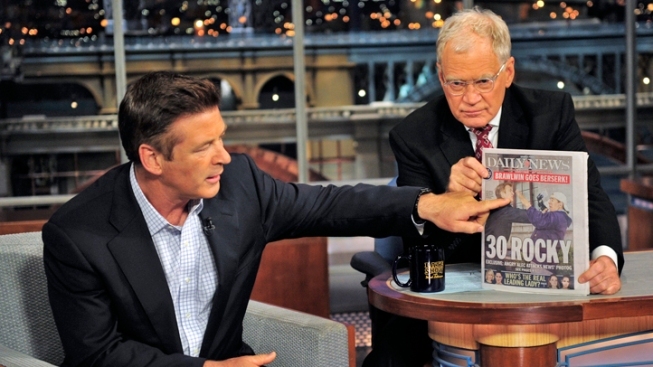 Alec Baldwin let it all hang out on Wednesday's "Late Night with David Letterman." The "30 Rock" star good-naturedly dropped his trousers to prove that he has lost weight. But Baldwin's half-naked stunt was just the entree before the evening's main course, as Letterman quickly turned to the elephant in the room: Baldwin's alleged dust-up with a New York Daily News photographer. "Let's get to it, shall we?" Baldwin said. "You're obviously burning to hold up the cover of the Daily News," he added. "The picture, without knowing the story, tells a tale that's often not true," Letterman said, in reference to a shot of Baldwin allegedly shoving photographer Marcus Santos. "Honestly, Alec, if this was me — look at how good you look!" Letterman joked. "I'm forming the letter 'F' with my mouth," Baldwin responded, to big audience applause. But Baldwin asserts that he wasn't cursing out Santos, who has filed an assault complaint with the NYPD. Baldwin said he was really just asking a technical question. "I said to him, as I walked to him: what F-stop are you using on the camera?"